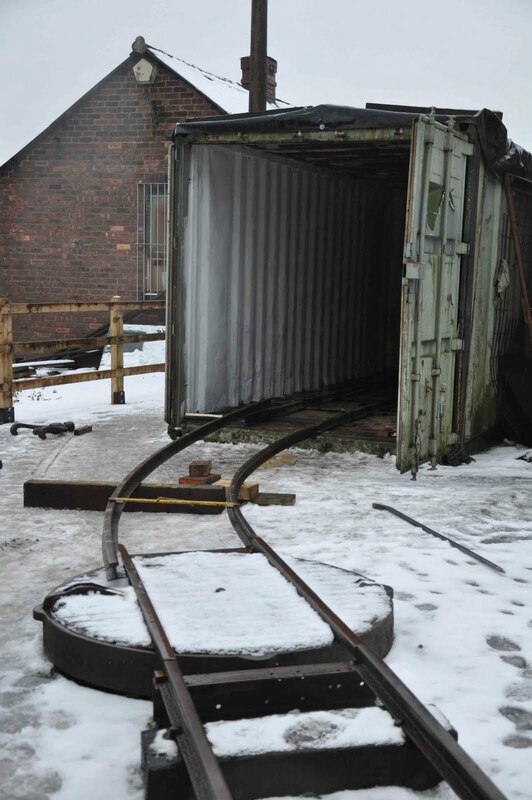 We’ve just had what may be the last working day of the year at the Moseley Railway Trust site at Apedale. A few hardy souls turned out to brave yet more snow; however, we did get to luxuriate in the almost tropical (by recent standards) temperatures of PLUS (yes, honest, PLUS) 2 degrees. We’ve shifted a fair bit of work, including major progress on the construction of track into the new C&W workshop container. As is usual at this time of year, one can reflect on what has been a momentous year for the MRT at Apedale. This time last year, we had a part-finished main line which ended just before what can only be described as a bog. Now, we are in a position to run passenger trains to a terminus where that bog once bogged. 2010, of course, saw the approval and grand opening of the Apedale Valley Light Railway; we can’t do that again in 2011, so next year will probably be one of consolidation. That said, there is plenty to look forward to. We should see the completion of the Silverdale station building, and hopefully a start on the MRT museum building. There’s also some interesting news imminent on the locomotive front – so keep looking in here. In the meantime, it just remains to wish both readers a happy new year. Get in touch here.